Juan Guaidó, opposition leader and self-proclaimed interim president of Venezuela, sits on a boat with staff members before crossing Maracaibo Lake to reach the town of Cabimas, Venezuela where he will lead a rally, April 14, 2019. While Guaido has gained backing from the United States and some 50 other nations, Maduro remains firmly entrenched nearly three months into the struggle for control of Venezuela. Guaido has been stripped of his immunity and faces the looming threat of arrest — something he warned would be a "big mistake." Juan Guaidó, opposition leader and self-proclaimed interim president of Venezuela, is surrounded by supporters at the end of a rally on the shore of Lake Maracaibo in Cabimas, Venezuela, April 14, 2019. 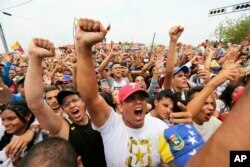 Supporters of Venezuela's National Assembly President and self-proclaimed interim president of Venezuela, Juan Guaido, cheer during his rally on the shores of Maracaibo Lake in Cabimas, Venezuela, April 14, 2019. "We're not going to bend our knees — if that's what they tell us to do,'' Guaido said, as the mass of people cheered in support. "Yes we can!" they shouted.